Zooey Deschanel’s collection for Tommy Hilfiger – To Tommy, From Zooey – has officially hit stores. 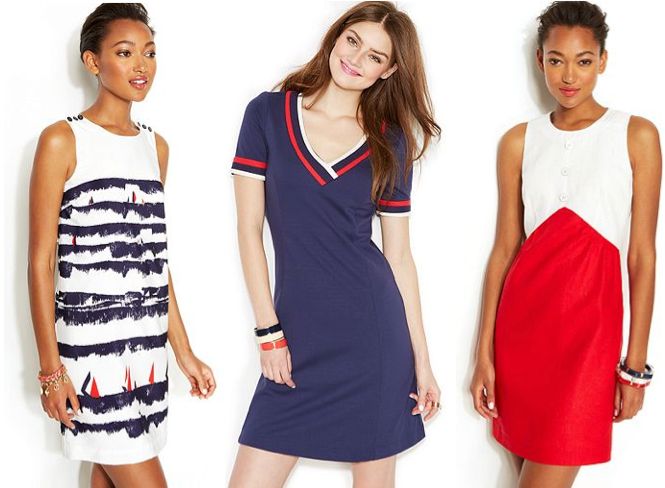 The nautical-themed collection of preppy, tailored cuts includes 16 dresses that come in sizes from 0 to 14, two purses, shoes and jewelry that all range in price from $35 to $199. A sleeveless shift dress that buttons at the shoulders features a retro black-and-white mod design (pictured at left; $169.50), while a sleeveless color-blocked white and red dress has a ‘60s-inspired vibe (pictured at right; $149.50). According to the Los Angeles Times, Deschanel will wear three of her dresses from the line during the Season 3 finale of her hit show, “New Girl,” on May 6. The collection is available at Macys and Tommy Hilfiger. Some of the To Tommy, From Zooey collection is on sale for 15% off with Macy’s code: MORE.